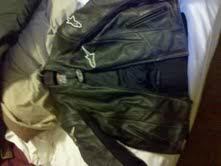 I am trading the lift kit from my truck to a guy in exchange for this jacket and some cash. Just wandering how much this jacket is worth? Thanks guys. what kind of a lift kit, how high, what make/model? we talking about a Daystar 3" or a SKYJACKER 8"? I would say the jacket is worth about $150-$200, depending on how much it was used. Its a 6in lift for a 2000 F-350 superduty made by superlift.All 4 leaf springs w/ four shocks. I paid 400 for it.He said the jacket was worth 200 bucks? Last edited by young7.3; 08-13-2011 at 11:37 PM. how much cash extra coming your way? i guess that depends on the jacket right?? If you know the guy well (friend) then $200 is fair and throw like $150 at you. But if you don't know the guy, don't say you paid 400 for the lift kit. That is at least an $800 kit, I understand if it is used BUT you have the shocks also... I would say he better throw AT LEAST $250 your way with the jacket. Just my opinion. I know a little about lift kits. No i dont know the guy. Hes off a different forum im a member of too. But was just wandering how much the jacket is worth. Thanks for the quick reply and help Trey. anytime man, i just know Superlift lift kits aren't the highest but definately not the worst, don't sell it short is all i am saying. Good luck. Quick Reply: How much is this jacket worth?